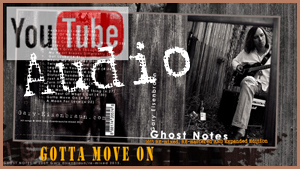 Gary Eisenbraun | Ghost Notes | "Gotta Move On". Gotta move on, to a better day. I will not linger where I don't want to stay. No complication, gonna bring me down. Don't leave me here in ruin. Gonna turn it all around. leading me down to the water. I'd tumble down a little harder. that keeps coming down on me. Gotta move on. No time to waste. the longer that I delay. No satisfaction in the status quo. even if it's all I know. Waiting for a miracle now. There's nothing left I can lose. and all the answers that elude. where no one's looking out for me. Gotta move on. To a better way. I'm getting torn and frayed. No solution gonna come my way. I'm the one that's been betrayed. but the time is too late. that makes it a habit to me. Next song: A Moan For Love.